W. Dale Carter Digital Land Database Collection, c. 1780-1820. Sullivan County Manuscript Collection 0061. The collection was placed on loan by W. Dale Carter to the Archives and History Division, Sullivan County Department of Archives and Tourism in September 2005. W. Dale Carter Digital Land Database Collection, spanning c. 1780-1820. MSS 0061, Archives and History Division, Sullivan County Department of Archives and Tourism, Blountville, Tennessee. The W. Dale Carter Digital Land Database Collection consists of a Sullivan County land grant database compiled by W. Dale Carter of Kingsport, TN. The database consists of maps and detailed information on Sullivan County, North Carolina Land Grants from c. 1780 to 1820. By entering the metes and bounds, combined with a careful study of surrounding land grants, Mr. Carter placed each of the plots on a modern USGS topographical map. The database allows contemporary researchers the opportunity to find the GPS coordinates to the exact location of an early land grant in Sullivan County, and to print out a map for the same. Special note: The Sullivan County Department of Archives and Tourism is fortunate to have such a rare donation as the W. Dale Carter Digital Land Database. Before conducting research in the database, however, it is most beneficial for the researcher to have a clear understanding of early land records processes and how they affect Sullivan County. The following narrative is offered by Mr. Carter in the interests of educating the researcher as to how land was transacted in early Sullivan. Copyright 2008, W. Dale Carter, Kingsport, TN. A historian or genealogist doing research in Sullivan County is at a considerable disadvantage. The only records before the Civil War that exist in the county courthouse are the records of deeds; however, all is not lost. These records of deeds contain much valuable information if one is willing to spend many hours, perhaps days or months gleaning these old records for clues left by our ancestors when they gave information to the county court clerk as to the purchase or the sale of their property. To get the most information from these old records one needs to understand the meaning of the legal terms used in the deeds and the geography of the area at the time the documents were written and recorded. Before the Revolutionary War, most of Sullivan County was believed to be located in the Colony of Virginia... that is, all the land on the North side of the South Fork of the Holston River. There were many settlers in the county before the Revolution but they could not obtain a legal title to land because land patents could only be issued by the crown and the King had decreed by the “Proclamation of 1763” that the land on the western waters could not be claimed or owned by citizens of the colonies. Furthermore, the Virginia Colonial Land Office was closed in 1774, and no land transactions were recorded until the state land office was opened in 1779. Research of land in Sullivan County before the Revolution is extremely limited, as I can find only four land patents issued by the crown located in the boundary of Sullivan County... namely the Pendleton Patent located on Reedy Creek, the James Buchanan patent known as “Holly Bottom” located a short distance down river from South Holston Dam, and Buchanan’s Patent known as the ”Hazelland” located down the river from “Holly Bottom”. A fourth patent was issued to Buchanan know as “Saplin Grove”, but this patent was partially in Virginia and partially in Tennessee. The present-day city of Bristol Virginia-Tennessee is located on this patent. The state line between Virginia and North Carolina was surveyed before the Revolution, and this line started at the Atlantic Coast and terminated near White Top Mountain. The location of any settlement west of this point was in doubt as to which state the property was in. In 1777, the legislature of the "new" state of North Carolina passed an act allowing the state to take over the title to all "vacant" land within its borders. This land had formerly been the property of the King or the Earl of Granville. In the same year, the legislature also passed an act creating a procedure for selling the land to almost anyone who had the money to pay the required fees. These "instruments" were called grants, but that does not imply the free gift of land. The first step in the procedure was for the prospective landowner to find some vacant land. He could choose land on which he has been living, an adjoining tract, or a tract far removed from his current residence. The next step was to have the claim recorded in the land office in the county where the land was. There was a small fee to pay for recording the claim. This is sometimes called "making a land entry" or having the claim entered in the records. A land entry taker was appointed to each county land office. In 1778, all required fees were supposed to be paid when the entry was recorded (entry fees, surveying fees, and grant fees). This soon changed, however, and only entry fees were required when the entry was recorded. Next there was a waiting period. The purpose of the waiting period was to allow time for everyone else to know the tract had been claimed. Other people could then decide if the claim included land that was already owned by someone other than the claimant. If such problems arose, there could be a court trial to determine who was really entitled to claim (or own) the land before additional steps were taken. If there were no disputes, the entry taker would issue a land warrant. The warrant was a form letter addressed to the county surveyor instructing the surveyor to survey the claim "without delay". The surveyor was paid based on the number of acres in the survey (which may have been slightly different from the number of acres in the land entry). When the survey was finished, the land warrant and two copies of the survey were sent to the North Carolina Secretary of State. Usually, surveys included the name of the surveyor and names of chain carriers. Chain carriers may have been neighbors or the person whose land is being surveyed, depending on who was present on that day. The Secretary was supposed to make sure the State Treasurer had received the state's share of the fees before he proceeded with a grant. The state charged 50 shillings per hundred acres between 1778 and 1781. Beginning in 1783, the state fee was raised to 10 pounds per hundred acres. Afterward, the fee varied; lower fees were charged if the land included a swamp or was mountainous. Still later, the state's fees were changed every few years. Using the land description in the survey, the Secretary (or one of his clerks) filled out a land grant. The Governor signed the grant. The state seal was attached to the grant by the Governor's Secretary. One copy of the survey was attached to the grant. The land description was recorded in the land grant books kept by the Secretary of State. The Secretary kept the second copy of the survey and the land warrant. The Secretary of State and Governor's Secretary were paid small fees for each grant that was processed. Prior to the Governor signing a grant, a "last minute" protest could be made. Paperwork survives for petitions dated between 1778 and 1835; such disputes were settled by a jury trial in the county where the land was located. Many times, we find a petition to the Governor, but we have difficulty determining the outcome of the trial. The grant was returned to the grantee. Sometimes this means the grant was returned to the county courthouse, and an advertisement was placed in the local newspaper announcing the arrival of grants from the Secretary. The grantee (new landowner) now had one year in which to have the grant recorded in books kept by the county Register of Deeds. There was a small fee to pay for this also. For as much as 50 years, no one actively made sure each grant was recorded in the county, so some grants weren't recorded in the county. In 1781, land entry offices were closed, possibly because the state wanted to change the fee structure, but there was no agreement on how much to change. Warrants could still be issued, surveys could still be done, and grants could still be issued (for entries already on the books) PROVIDED the required fees were paid. In 1783, the county entry offices were reopened, and the grant fee to the state was four times the previous amount (10 pounds versus 50 shillings per hundred acres). The primary sources of land warrants are the Secretary of State's land grant files now in the North Carolina Archives. 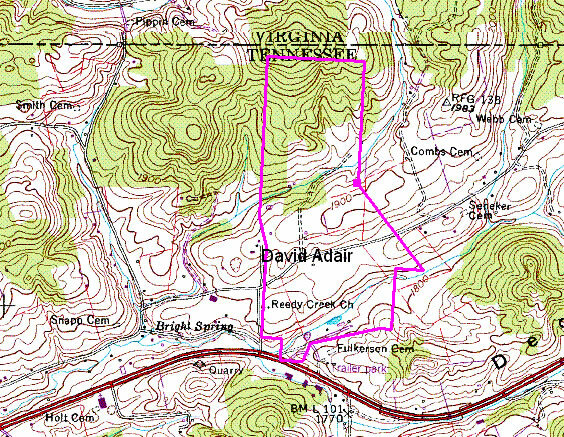 All of the Sullivan County North Carolina Land Grants that could be located have been plotted and the plots have been placed on a modern USGS topographic map. This is a work in progress and many of the land grant plots have yet to be accurately placed on the USGS map. There are two land records files on one of the Archives computer. One file, which I term the “master file” (Sullivan County), contains all the land grants and deeds that I have plotted to date. The other file “Sullivan Co., N. C. Grants” contains all the North Carolina land Grants that I have placed on modern USGS maps. If one is interested in finding whether an individual is mentioned in the Sullivan County land grant records I suggest they use the so called master file (Sullivan County). If one would like to know where the land is located then the Sullivan Co., N. C. Grant file should be used. William Dale Carter was born 1926 in Hiltons, Scott County, Virginia to Rev. Thomas Raleigh Carter and Clara Maude Carroll. He graduated from Hiltons High School, Scott County,Virginia, and attended Berea College for one year before enlisting in the Army Air Corps aviation cadet program during WWII. After the war he graduated from the University of Missouri School of Mines with a degree in Chemical Engineering. He was employed by Eastman Kodak and retired in 1986 after 36 years of employment. Mr. Carter has conducted extensive historical and genealogical research in East Tennessee and Southwest Virginia.